The featured images this week are: Tom Chambers’ Prom Gown #3 from his Rites of Passage series and Blue Fox from his Entropic Kingdom series, and Laurie Tümer’s Watersheds and Graffiti Artist Against Vandalism from her Oil Exploration: Not in My Backyard series. "As my daughter entered adolescence I was dumbstruck by her sudden abandonment of the authenticity characterizing a carefree childhood and the mysteriously forced adoption of artificialities so common in adulthood. In Prom Gown #3 I portray that painful transition into adolescence. The young girl lies sacrificially in her elegant prom gown set in contrast with the unspoiled natural grandeur of the wild West. This photomontage was created from several different individual images taken in Wyoming and Virginia." "Blue Fox was inspired by painter Andrew Wyeth who expressed a strong emotional connection to the earth through the use of texture and color in his paintings. Similar to Andrew Wyeth, I grew up in Southeastern Pennsylvania and share a love for the land. In my image the dogs bound across the landscape, just like those on an equestrian fox hunt, while the young lass adorned in a blue dress protects herself from all that might be harmful. Both the child and the animals share a vulnerability in a disturbed ecosystem. Blue Fox was created from various elements photographed in rural Virginia." 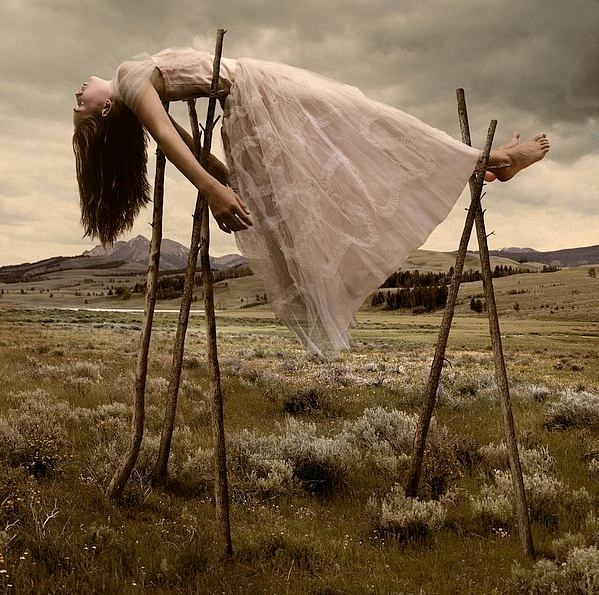 See more images from Tom Chambers here. Laurie Tümer’s series Oil Exploration: Not in My Backyard was made for the Galisteo Basin Photography Project, which aimed to raise awareness about oil drilling issues facing New Mexico in 2008. photo-eye Gallery exhibited this project in 2009, in addition to designing a limited-edition portfolio of works from this exhibit, one of which is in the collection at the Palace of the Governors with Governor Richardson’s signature. To keep alive the warrior spirit found in the rock art images of warriors in Galisteo, Tümer was inspired to merge her interests in rock art and graffiti. She became an honorary member of a graffiti crew educating young people about oil and gas issues. Watersheds was made in late 2008; it shows a Google Earth map of the Galisteo watershed on her garden wall and the watershed markers of the economic downturn month by month during her participation in the project. This piece was completed the day Barack Obama was elected president. These coalesced with another watershed: an announcement that because of Galisteo community organizers, New Mexico now leads the nation in the strictest oil and gas regulations. 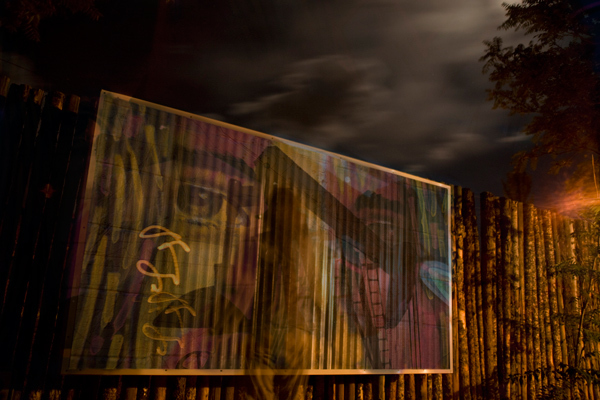 Graffiti Artist Against Vandalism shows one of the billboards Tümer constructed in her backyard for the project. 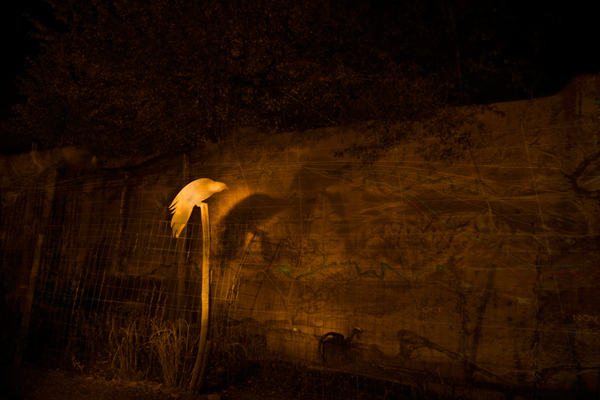 This piece is included in Robert Hirsch’s new 5th edition of Exploring Color Photography. Tümer currently teaches the first online photography and art history courses at Santa Fe Community College: Camera Use & The Art of Seeing and The History of Graffiti: From Glyph to Graff. See more images by Laurie Tümer here. *Next week's featured artists will be Hiroshi Watanabe, Michael Levin and Julie Blackmon. If you missed PART ONE of Currently on Display you can read it here.